TV dystopias, of late, have been surprisingly glossy. Black Mirror creator Charlie Brooker has described his show as being about "the way we might be living in ten minutes' time if we're clumsy". As such, its imagined futures mostly show the socioeconomic status quo holding firm, perhaps with some nice technological improvements making life physically more comfortable, while pondering the privacy and ethics implications of the same tech. Similarly, HBO's Westworld, which concluded its first season last week, never visits and barely mentions anything outside the gates of the android theme park, but hints that this world is a disease and crisis-free one; a technological Eden, with its greatest failing being that it's maybe a bit boring. Seemingly, the astonishing development of AI automata, indistinguishable from humanity, has had no social or economic effects at all, allowing the show to get on with pondering our moral obligations to any sentience we might create. These are certainly interesting questions, but they're not necessarily pressing ones, unless what keeps you awake at night is the thought that your next smartphone might be a bit too good. 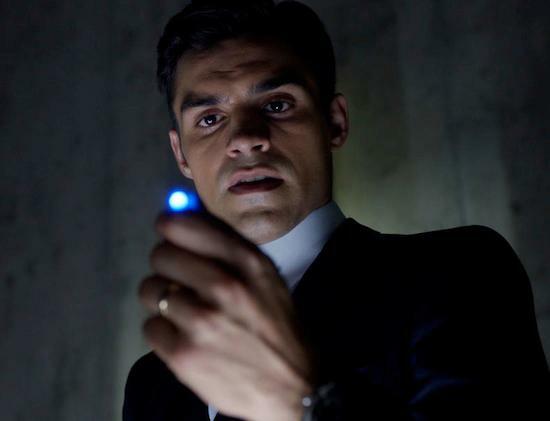 SyFy's Incorporated, from writer-directors Àlex and David Pastor initially appears to be cut from the same cloth. In the year 2074, a pair of expensively-attired yuppie-types ride a shiny elevator in the futurist headquarters of SPIGA, a multinational biotech firm. Stopping unexpectedly, the doors open to reveal a third such chap, but with a bag over his head being escorted by two militaristic security personnel. We then see the hooded man being tortured inside an expensive-looking anechoic chamber by SPIGA security chief Julian, played with a calm menace by Dennis Haysbert. So far, so creepy-future. However, as we watch beautiful people from beautiful homes take self-driving cars to elegant offices and opulent restaurants, we hear snatches of radio and TV news reports about terrorist attacks and environmental disasters, leading to the key reveal; the world is in tatters, and the blue skies and rolling hills by the freeway are video wall fakes, surrounding the perimeters of small and highly secure "Green Zones". Climate change has led to famine, famine has led to the collapse of government, and private corporations "control 90% of the globe" with their private armies. Corporate employees and the privately wealthy get to live in a high-tech version of 1950s North America, while everyone else fends for themselves in anarchic "Red Zones". There is something slightly cartoonish about this set-up, and when we finally see a Red Zone, it's almost comically Judge Dredd. In a run down tower-block, the lifts no longer work, so visitors pay a motorcyclist to drive them up the flights of stairs, for example. Yet strangely, while no-one can afford an elevator technician, Red Zone bars and clubs are huge, busy, and drenched in neon and holographic signage, and everyone has a fabulous haircut. I've personally drank in scarier and scruffier places in the last fortnight. Similarly, some of the dialogue is so on-the-nose it could make a cat laugh and a hyena groan; "It's the just the tip of the iceberg", says SPIGA boss Julia (Elizabeth Krauss), going on to add, "Do you know that expression? It's from when I was a kid". Cut to protagonist Ben Larson (Sean Teale) wearing a puzzled expression, just to drive the point home with a mallet. As silly as all this is, as with the Pastor brothers' underrated movies - sci fi thrillers Los Últimos Días and Carriers in particular - there are much more interesting things going on below the trope-heavy surface. The show is executively produced by Matt Damon and Ben Affleck, both politically well to the left of the average Hollywood player. Affleck is an outspoken supporter of trade unionism, a national living wage and universal health care, among other such nitty-gritty economic left viewpoints. Damon grew up with left-wing historian Howard Zinn as a neighbour, and later narrated a documentary about Zinn's life and work, and an audio version of his unabashedly partisan polemic A People's History of the United States. As such, it's not hard to see what will have attracted them to Incorporated, as the show is explicitly and primarily about economic class. And the stratification thereof is more sophisticated than the show initially leads us to suspect. There's a sort of upper working class, who are allowed to work as servants and cleaners in the Green Zones. A desperate underclass scavenge, sell drugs, or turn to prostitution or a brutally unregulated form of cage-fighting, a favourite entertainment of the rich. But there's also a precariat lower middle class who are one bad performance review away from lobotomisation and exile to the Red Zones. The implication is that while this world is very bad for some people, it's not good for anyone. Ben's wife Laura, a cosmetic surgeon, uses her access to almost-magical scar-removing technology to cover up her self-harming, which seems to be driven by a combination of fear of the underclass and guilt over her own privilege. While the show has a couple of pantomime villains for narrative expediency, and employs an angelic Lost Girl so far solely as a MacGuffin, it largely avoids the idea of the virtuous poor pitted against the evil rich, and there is ambiguous morality all the way up and down the ladder. And it's this that gives Incorporated a chilling edge. It posits a world where billions have been thrown under the bus, not by a dictator, or by a conquering enemy, but by morally normal people who are enough on the right side of the inequality gap to avert their eyes. A particularly powerful sequence shows us a "Climate Refugee Camp" half-populated by orphaned children, clearly modelled on the Calais Jungle camp. The point couldn't be clearer; a lot of this stuff is already happening, and we're not doing much about it. Given the lead time on producing a show like this, I'm sure nobody involved anticipated the launch-month arrival of a climate change-denier in the White House, promising massive deregulation, de-funding of public science, and peppering his cabinet with bankers and CEOs with no government experience. The show's underlying theme that big money and small government are a toxic combination is no more or less valid because of that, but it has made it timely. Incorporated suggests that the greatest threat to civilisation is not demagoguery or ideology, but simply the ability of the wealthy to part company with the poor when the going gets tough. And it dares to hint that we'll miss governments when they're gone.